The timer, "bare". Does not include the temperature sensor or any other accessories. Allows the temperature sensor to be secured to a developer tray. Allows the run-reset switch to be operated hands free. Fitted with 2m cable. Cable may be extended with a 3.5mm stereo (three-pole) female-male jack lead. Allows a water-tight seal on the temperature sensor - ideal for fitting the sensor to a developing tank when using inversion agitation. 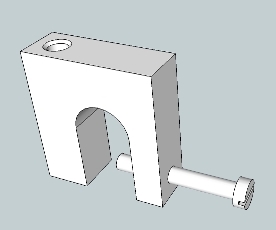 6mm to fit temperature sensor, requires 12mm / 1/2" hole to be drilled. A drop-in, lift-out wall cradle to hold the timer unit. 3mm clear acrylic, supplied with wall fixings. A stainless steel-encapsulated precision thermistor, 6mm diameter. Additional Sensors may be useful to avoid swapping sensors between tank and tray, for example. Nominal 6 inch length as supplied with the "basic" and "full" sets. 4 inch and 2 inch sensors are also available on request - please contact us - the shorter sensor is convenient for permanent mounting to a developer tray using the gland above. The standard unit is supplied with a temperature coefficient of 2.5 programmed in the firmware. We are able to programme your preferred temperature coefficient instead. To do this, add the timer to your cart then add the User-Defined Curves to the cart also, with the button below, stating the temperature coefficient required. This should be in the range 0 to 4.0 - please contact us if a number outside this range is required. We will then programme your unit accordingly. The charge for your bespoke programming is £20. It is possible to verify the implemented temperature coefficient in the unit you have - refer to the instruction manual. If you require an existing unit to be re-programmed to a different coefficient, this can also be carried out. The basic cost will be the same however shipping costs will apply - please use the contact form or email us at enquiries@dlgelectronics before sending your unit.